We Came As Romans have issued a statement to confirm that their planned tour with Bullet For My Valentine will go ahead as planned. 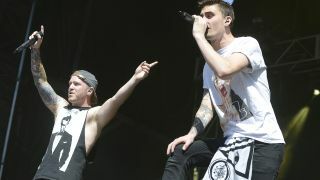 Vocalist Kyle Pavone died late last month at the age of 28 after an accidental overdose, with his bandmates subsequently setting up a foundation in his name. And although they had been booked to tour across the US with Bullet For My Valentine, it was expected that they'd take a step back in light of the tragic circumstances. But the band’s co-vocalist Dave Stephens has issued a video statement on behalf of We Came As Romans to say that the tour will go ahead in honour of Pavone. Stephens says: “Over the last few weeks, Kyle’s family, his fans, his friends and the five of us have been experiencing a very wide range of emotions. For us, it’s been the most difficult time of our lives. “Through this, we’ve been trying to be very honest with each other and open about how we’re feeling and grieving. Stephens adds: “We will not be replacing Kyle – we’ll be continuing on, the five of us, and honouring his life over the next few weeks while we’re on tour.